Above you see Link and the Great Deku Tree, Guardian Spirit of the Forest and one of the forces that kept evil at bay in the kingdom of Hyrule. This is from the game The Legend of Zelda: Ocarina of Time. To setup the story the evil villain Ganondorf, King of the Gerudo Tribe. He wanted to take over Hyrule and turn it to his twisted ways. He first went after the Great Deku Tree. He was the guardian of two very important things. For one he carried Kokiri’s Emerald, one of three Spiritual Stones and a key, used to open up the Door of Time and second he protected the beings of the forest known as the Kokiri and one little boy that was not, Link. Since Ganondorf did not get what he wanted he infected the Great Deku Tree with a curse. 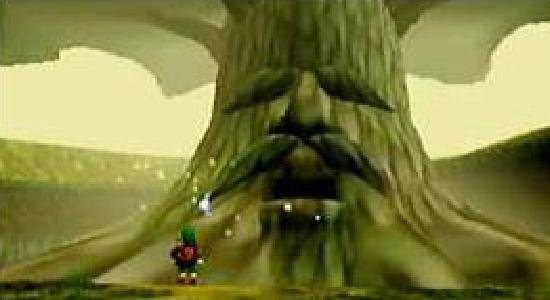 This is what I think about when I think of the Great Deku Tree’s request to Link. Purge the curse that is within him. Link did not know what to expect. The only thing he knew is that he had to be ready to defend himself from danger that could be within. The Great Guardian knows that he was inviting him to the beginning to what could be the end of Link’s life but he had to set him up for a journey to save the world as was prophesied. Thankfully as you play Link, our hero, he wins. If we are to accept the task that Jesus gave us we have to be courageous to face the unknown of what goes into accepting his request. We may lose “friends” but we may also gain some new ones. We may lose touch in who we used to be but we will grow to be better people in Christ Jesus. We may die for His great cause but our sacrifice will not be in vain. Heavenly Father, I want to vow to you that I have the courage to do what you request of me. That I will share your gospel and your love with those around me. Even though I am scared please stay by my side and help me to garner the courage to move ahead. Thank you God for giving me the strength to keep on moving forward no matter the costs for Your greater good. In Jesus name, Amen.